Nigeria has been in the forefront of deploying military resources for peace instead of war. 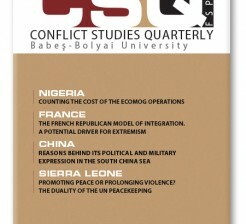 This new approach to conflict, which gained currency immediately after the World War II and has come to shape international relations in the beginning of the 21st century, is constantly bedevilled by far-reaching socio-economic implications due to the often haphazard and disarticulated approach of such engagements. Although Nigeria stands tall as a vanguard of peacekeeping around the world, the collateral impacts of these overtures on her domestic affairs has been daunting. From 1960, when she first sent her troops to quell the crisis in the Congo, the country has participated in more than 30 peace missions around the globe, some of which she actually initiated. Nigeria`s spearheading of ECOMOG operations was not without some far-reaching impacts on the home front. Her experiences in spearheading the ECOMOG missions in Liberia and Sierra Leone came with not only tales of war but other extra-military impacts suffered by the country during and after those operations. This paper attempts to interrogate such domestic fall-outs and argues for a sufficient articulation of such exercises to mitigate long- term impacts. Nigeria, ECOMOG, Peacekeeping, ECOWAS, Military Policy. Perhaps only in the time of the crusades the Western rhetoric has been more concerned with the people of Muslim origin. With the Middle East turned into a warring zone by various factions, and the Western world scared of the menace Islamic extremists present, the subject discussed in our paper is very timely. Thousands of people have led to ight alongside extremist organizations such as ISIS, European far-right parties are on the rise and refugees are washing off the shores of the Mediterranean Sea. But no Western country is under greater distress than France with its nation troubled by terrorist attacks and by the latest outburst of protests. Analyzing the legal framework within which the French Model of integrating immigrants works, we attempted to assess its effectiveness and lack thereof, in order to try and explain why France is only preceded by Russia when it comes to the number of Westerners joining the rows of ISIL. Our findings include clear evidence about the low quality of life that people of immigrant descent have, the lack of possibilities to overcome their condition, the lack of sustainability that the model exhibits and the escalating effect that the current State of Emergency has on it all. And since all of these constitute drivers for extremism, we consider France to be in urgent need of policy developments that would slow down and even stop the radicalizing trends that we believe are in motion. France, Immigrants, French Model of Integration, Contract of Integration. Malacca Strait. Until then, China’s actions in the South China Sea can be seen as the necessary steps to achieve this leverage in their position with the US and other regional powers. Therefore, we can state that China’s policy towards the South China Sea can represent a preemptive measure based on reducing China’s energetic security threat concerning a potential blockade of the Malacca Strait by the US or India, in case of conflict escalation. South China Sea, Malacca Strait, Energy Security, Sea Kine of Communications, Military Development, Teritorial Disputes, Resources. Based on different mechanisms of intervention deployed by the United Nations to intrastate conflicts – peace enforcement, peacemaking, peacekeeping and peacebuilding – it is possible to assume that, in specific cases, the role of the UN in the field contributed to perpetuate the levels of the violence. Such elucidative argument is justified in accordance to the analysis provided in both missions promoted by the institution in Sierra Leone – the United Nations Observer Mission in Sierra Leone, UNOMSIL (1998-1999); and the United Nations Mission in Sierra Leone, UNAMSIL (1999-2005). To discuss this argument and substantiate it, this research was divided into two parts: a critical analysis of both UNOMSIL and UNAMSIL. In each peacekeeping mission, the research focused on a chronological analysis based on the documents published by the both UN missions, such as reports, statements and letters regarding their security, humanitarian, political and economic issues. This division is necessary to understand not only the role of the UN in the field, but how this same international system can influence and also be considered responsible for maintaining and prolonging violent conflicts, while its mission is to promote a world peace.